After their stunning album “After The Battle” a lot of positive credits were given, but most of the fans still prefer their brilliant live performances. So after a short period of preparation the band decided to make a DVD. Between their studio album and the live-recording leadsinger Kees Bik left the band and Karel Messemaker ( November, Dreamcarnation ) took his place. 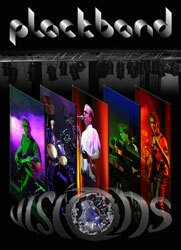 If you like emotional symphonic rock in a live ambiance you must buy this DVD. Atmospheric and powerfull keyboards, brilliant guitarlicks and solo’s, bass and basspedals pumping in stomage, superb rhythms and last but not least characteristic and beautifull vocals. It contains most of the songs that brought Plackband fame since the band’s first performance in 1977. This DVD is a unique document with audio and video recordings never previously released. The audio mix in Dolby 5.1 and stereo of the concert is so dynamic, it will blow your head off! This box includes also a separate audio CD of “De Boerderij” concert and offers many extras such as a 16 page full colour booklet, a funny audio mix of “Little Minds” in “The Making Of” section and a slide show of the early buyers in “Guests”. After releasing three Dutch bands Xymphonia Records goes international with the release of the album “El bufó de la Cort” from Dr. No, a band from Catalonia. On this debut album the Jester (El Bufó) tells their first story. Enric Pascual and his musical friend Conrad Dubé have composed a beautiful melodic symphonic rock album. The emotional sung Catalan lyrics give this album a unique atmosphere. In the mellow moments of the album bands like Camel and Eris Pluvia will cross your mind. And the Jester on the cover is not the only thing that will remind you of the early Marillion. This makes the album easy to consume and interesting for a broad audience. 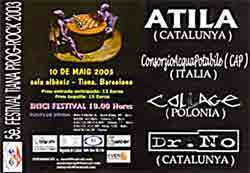 The album will be presented at the 5th Tiana Prog Festival (10 May 2003) where the band will play together with Atila (Catalonia), Collage (Poland) and Consorzioacquapotabile - CAP (Italy). Tiana is located close to Barcelona. 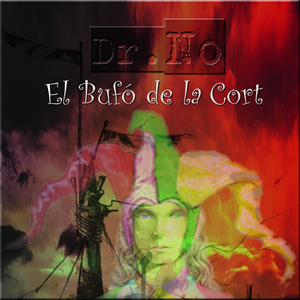 After releasing three Dutch bands Xymphonia Records goes international with the release of the album “El bufó de la Cort” from Dr. No, a band from Catalunya. 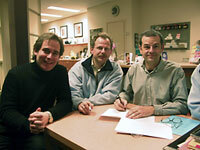 On March 15th Enric Pascual & Conrad Dubé visited Holland to sign the contract with Xymphonia Records. Dr. No is probably the first Catalan band that is contracted by a foreign record company. We at Xymphonia are very proud to present to you the delicate and unique music of this Catalan band. The Jester (El Bufó) tells his first story on this debut album of the Catalan band. Enric Pascual and his musical friend Conrad Dubé have composed a beautiful melodic symphonic rock album. The emotional Catalan vocals give this album a unique atmosphere. In the mellow moments of the album bands like Camel and Eris Pluvia will cross your mind. And the Jester on the cover is not the only thing that will remind you of the early Marillion. This makes the album easy to consume and interesting for a broad audience. At the moment we are working hard to finish the artwork and mastering of the album. We will keep you informed about the release date. 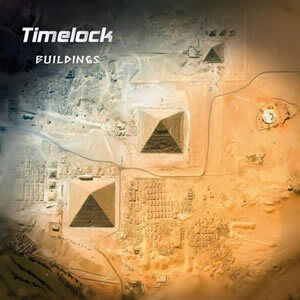 Timelock: After a period of 8 years Timelock is back! A few months after the release of "The Dawn" (1994) their record label SI Music went bankrupt and Timelock were forced to stop for a while. 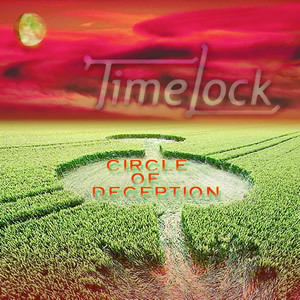 Now after 8 years they have recorded a brilliant new album entitled "Circle of Deception". With FAF (For Absent Friends) drummer Ed Wernke they recorded 10 complete new songs (including a 12 minute epic) at the Holland Spoor Studios in The Hague. The official release date of this album will be October 15th. The album will be presented at an official CD presentation which will be held in venue "de Boerderij" Zoetermeer, Holland on November 1st. Timelock will be supported by FAF (For Absent Friends). 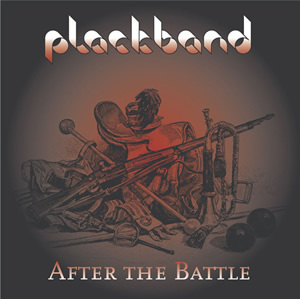 Rob Boshuijzen: percussion on "The Road To Babylon"
Sandra Jungsläger: vocals on "Man in the Mirror"
& "Everything Except the World"
Hans van Lint: vocals on "Man in the Mirror", "Everything Except the World"
Plackband: Reviews & license deal "After the battle" album. In the media section you'll find some new reviews of the "After the battle" album and the CD-presentation (release-party) held at "de Boerderij" in Zoetermeer. We are planning a lot of concerts in Europe and the rest of the world. The first gig will be on June 29th in Zuiderpark, The Hague. More concerts will follow in Holland, England, Mexico and Spain. We will keep you informed! 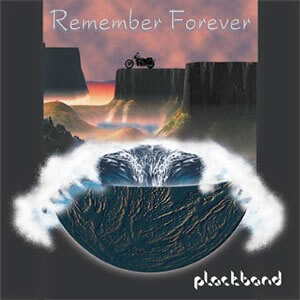 After 25 years the legendary Dutch progrock band Plackband will finally release their first studio-album. This concept-album "After the battle" features 6 of their famous classics and a few new compositions. The full-length version of "Remember forever" completes this superb CD. 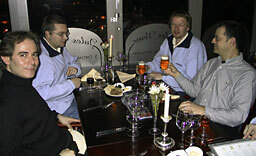 In the year 2000 the band reunited in their original line-up and gave a few concerts. The reactions were more than warming and they decided to record their songs. Xymphonia Records proudly presents this outstanding symphonic rock release on their label. The release date of this album will be the 19th of April. The album will be presented at an official CD presentation which will be held in venue "de Boerderij" Zoetermeer, Holland. Don't miss this special concert! Xymphonia brings you the single version of a complete new track from their forthcoming album "After The Battle". But that is not all. As a gift to their fans we present also the remastered version of their legendary EP on the same release. 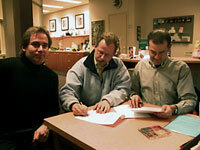 Entropy started during 1999 large scale promotions with "Perception" which led to many positive reviews from the media. One of them, Xymphonia Records, were surprised by the superb vocal parts of Maaike Breijman (she passed her exam in 2000 on the Conservatory of Alkmaar) and the combination of great heavy guitar riffs and atmospheric synthesizer parts. 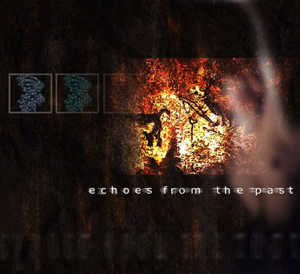 "Echoes from the past", their second full album has been released at Xymphonia Records in September 2001. On this album you find 9 brand new songs and two re-recorded songs from "Perception". Contributions were made by Irene Barel, violin and Peter Boer, cello.